This post contains some affiliate links for your convenience. You still pay the same price but I receive a small commission. 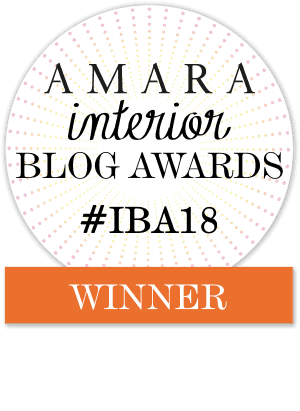 Thank you for helping me support my blogging addiction! Click here to read my full disclosure policy. Woo hoo! It’s finally time to share the One Room Challenge reveal. If you are unfamiliar with this fun challenge, it’s a 6 week room reno/makeover hosted by Calling it Home. 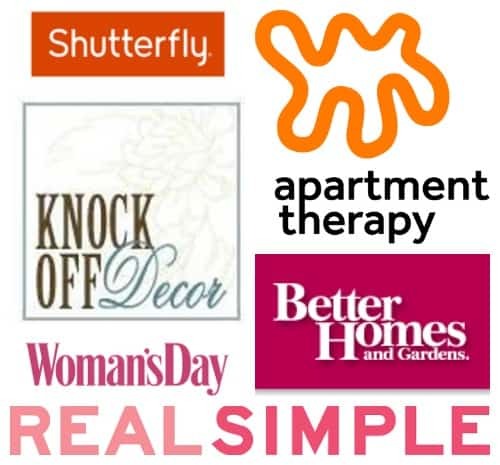 Amazing sponsors and bloggers are featured and anyone can join as a guest participant. This is the first time I have joined in on the shenanigans and decided to makeover our kitchen. 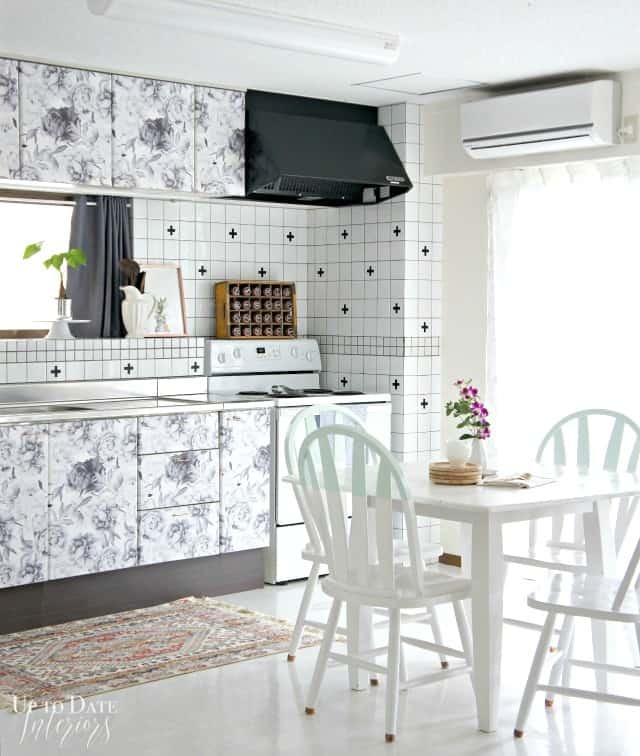 When we were looking at rentals in Okinawa, what drew me into our house were the white floors, light colored cabinets, and light walls. Even though the materials are cheap (linoleum, plastic, and concrete), I knew this house would be a perfect canvas to decorate. After the first kitchen facelift I did last year (you can read about that HERE), I felt like the kitchen wasn’t along the same style as the living room and foyer. Since all the rooms are in the same space, I really wanted to “dress up” the kitchen so that it was on par with the living area by adding a floral feature and a bit more color. Here’s the first makeover when I incorporated mediterranean colors into our space for last summer. We still love the DIY plate magnets but the rest of the kitchen was begging for a change. At least I’m sure it would if could communicate with me. Fresh colors and patterns were my inspiration for this challenge. Now the entire kitchen is gorgeous; linoleum floors, stainless steel counters, white tiles, and all. I’ll give you a rundown of what I accomplished during the last 5 weeks. The kitchen table got a pop of color with a mint color block on the chairs. Thanks to my husband’s suggestion the color is on an unusual part of the chair. The kitchen cabinets and counters were better organized with help from my new Epson portable label maker. I added a fun peekaboo pineapple print from Minted for a little kookiness. There’s no ignoring the trendy black swiss crosses on the backsplash that was a super inexpensive DIY. You can see the tutorial HERE. And floral removable wallpaper on the cabinets from Walls Need Love (with spray painted gold pulls from the dollar store). Because doesn’t everyone put floral wallpaper on their kitchen cabinets? lol It might not be everyone’s cup of tea but it’s a great conversation starter! To see how easy it was to apply the wallpaper, click HERE. It’s safe to say the feature floral “wall” created the wow factor that I wanted and I’m enjoying every square inch of our living area. Here’s a picture so you can see how it flows into the living room. I hope you enjoyed the big reveal! A big thank you to these companies for sponsoring my project; Minted, Epson, and Walls Need Love. This post is linked to Pretty Project Party @ This is Our Bliss. « ORC Reveals to Watch For! Love that floral paper so much! All looks lovely and you just have the cutest kitty. Thanks Julia! I love that darn cat but he can sure cause trouble. lol He does make a fabulous model for my pictures! those cabinets are SO fun and unique! love them! Thanks Nicole! I’m glad I changed the pulls to gold. I can’t stop staring at the cabinets. That wallpaper is SOO pretty! What a fun space! You incorporated some great ideas for a renter-friendly space. Congrats on finishing your first One Room Challenge! I think the floral cupboards are amazing! What a fun idea and I love that it is unique. I am a huge fan of being different and being true to yourself! It turned out great! Wow! You really warmed up the space nicely. I love the wallpaper so much. I wish I had seen this 10 years ago when we lived overseas and had boring military housing. I was constantly trying to improve it. Thanks!! I’ve been sharing my resources with the military spouses out here. What a transformation they can make on base! It looks so amazing! Great job. What a fantastic makeover for a rental space. The Swiss crosses are awesome, and I’m in love with that china cabinet makeover. Great job! I’ve never seen paper on cabinets like that. Very unique and stylish! Your kitchen turned out so fun and unique! The wall paper makes such a statement and I love the color block chairs! Thanks Amanda!! I wanted to create a “feature wall” with the cabinets so I loved hearing that! Yes! Your wallpaper cabinets are genius. And I love the color blocked chairs. Gorgeous! The most adorable kitchen ever! What a fantastic use of wallpaper Kathy! If I were your landlord, I would leave this as is! So very pretty and may I say, genius! Congrats and cheers to us! Now unto the next room! Finally I get to see these cabinets! and they are as cute as I imagined! I really like them. best! Awsome! Thank you Mila. You’re sweet. Beautiful job transforming your kitchen space. I love the cabinets and fun DIY on the tile! Thank you Tammy! I’m surprised how easy both projects were. Wow! What a fun and surprising way to update a rental kitchen. Love the floral wallpapered cabs.. so fun and fresh! So much life in this once boring kitchen with such inexpensive upgrades. Great ideas for the rental crew (like me.) Can’t get over that removable wall paper. it is so pretty. Well done! Thank you so much Maggie. We definitely have our challenges with rentals but I’m super happy how my kitchen turned out. I’m in awe of your creativity with the cabinets and tile. Also that pop of pink inside the china cabinet is fabulous–it really does complement the whole design beautifully! The cabinets are GENIUS! What a fun and unique way to update cabinets without the headache of PAINTING! Congrats! Looks great!! I ADORE that you just WENT for it in here! It is so unexpected, and so unique. My hat is off to you!!! What a fun and unique space-I love the final look! Way to go! Thanks so much for the sweet words and your support throughout the challenge Kristin! 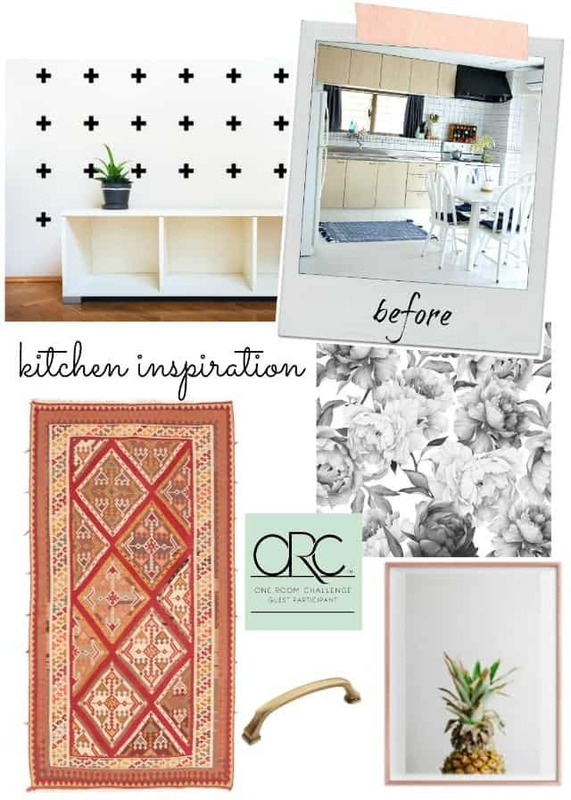 I love a BOLD One Room Challenge space and you definetely did it! Using the floral wallpaper on the cabinets was brilliant. It adds so much non-permanent character and shows people how unique a rental can be. Great job!! You are a miracle worker! I would NEVER have imagined a kitchen that looked like the “before” could turn into such a glamorous, bright and beautiful “after”! I am AMAZED! Seriously, socks knocked off! Wonderful, wonderful job Kathy! What a great way to turn a rental into your own space! Fantastic job! Those wallpapered cabinet doors are just amazing!!! Your kitchen is so unique… Well done! Thanks Nadia! I had such a good time putting it together. Instant gratification with those cabinets! That wallpaper is incredible definitely a conversation starter! Great space and great work! What a fun space! So unique. I love anything black and white, so this is right up my alley. 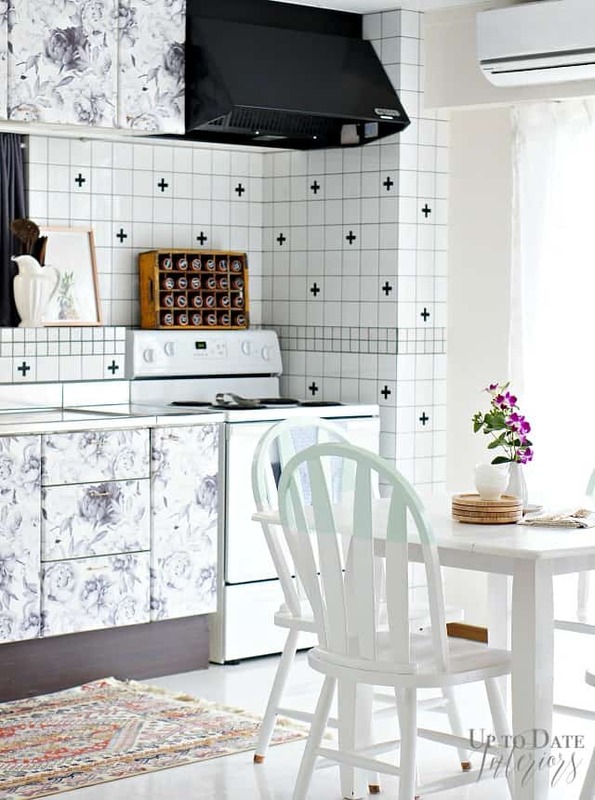 I especially love the Swiss cross tiles! Your space is incredible! I must wallpaper everything in that beautiful wall paper you used now! So many fun elements. It’s like a gorgeous dance party for my eyes. Love how creative this is. Great job. Thank you so much Linda! This was my first ORC and was such a great experience. Thank you for being such a wonderful hostess. I really love the cabinets! They really are a different style but that’s what I like about them! Nobody else has cabinets like that! Your kitchen looks great! WONDERFUL!!!! I can’t remember if I have commented , lol. But, I adore your room reveal! The dining set makeover looks fantastic in your new kitchen. Love the cabinets. Gorgeous job, Kathy! I love all of the pretty patterns you incorporated. That rug is so beautiful and the way you painted the chairs is so creative and genius. Love it! Please can you tell me what paper you used? Does it have a name or number? and lastly where can I buy it? Thank you in advance I reall love this Idea and will do it myself. Oh yes! The paper is called Clara and it’s from Walls need Love. You can find a link to the product in the post. 🙂 I’m so glad you love it! Pls stop by to see the reveal tomorrow . Thank you so much for the kind words and stopping by! wow kathy ! you did a great job I am so lovin it.